On the stove top, heat 1 tbsp of coconut oil until it is melted and pan is hot. Add in the chicken and season with salt and pepper. Toss as it is cooking to insure all sides are being cooked and don’t burn! Add in the minced garlic cloves and let it cook along with the chicken. Chop up and prepare veggies if you have not already. Add in coconut aminos to chicken and then add in the honey. Continue to stir and cook until chicken is cooked through. Remove chicken from the pan to a plate off to the side of the stove. Toss in veggies of choice and sprinkle with salt. Add in a little water at a time if needed to steam the veggies a bit and make them soft. Cook until done to your liking. 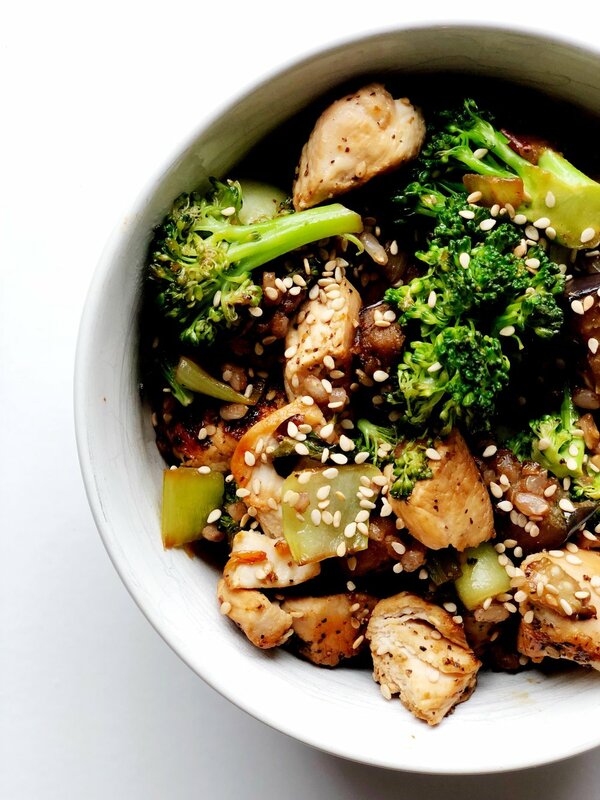 Toss veggies with chicken and sprinkle sesame seeds on top. Add fried egg if you chose to!